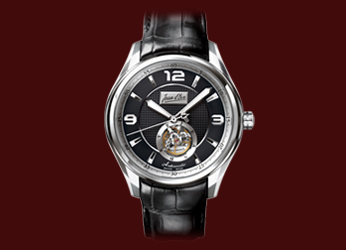 The "Ro-Tonda Automatic" collection features a round case and provides a basic format for reading the time. The dial is available in black or white colour and is divided into 4 rings. The outer 2 rings feature a minute track and 12-hour indication by a mix of numerals and stick indexes. The 2 inner rings feature patterns that enhance the look of the watch and an open window located at the 6 o'clock position reveals a partial view of the watch movement. The whole movement is also visible through the transparent case back. Available with an alligator strap in black or brown colour.